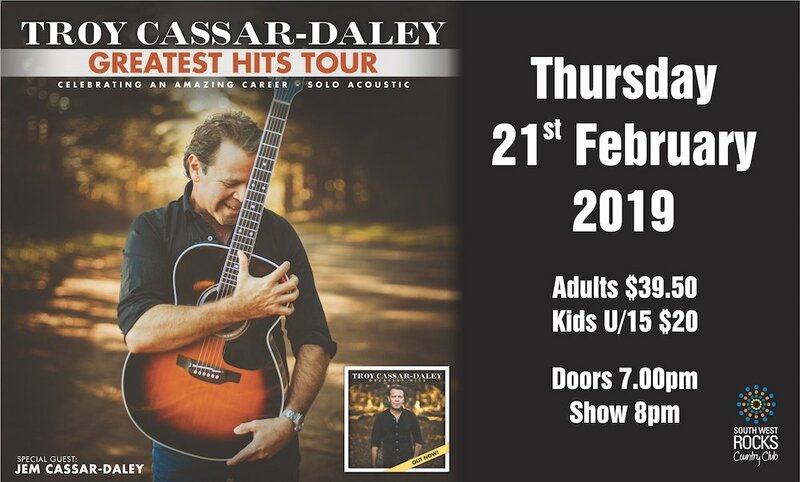 Great News Everyone…The incredibly talented Troy Cassar-Daley is coming back to the club for his Greatest Hits Tour on Thursday 21st February 2019…and we can’t wait. Troy’s a Country Music Superstar. and loves coming here to play in SWR, and we know you love him too…He’ll be playing all his hits you know & love…With Special Guest Jem Cassar-Daley…so it will be a wonderful night. Tickets are Adults $39.50 & Kids U/15 $20…Tickets go on Sale Friday 19th October. His last show here SOLD OUT…so get in quick for your tickets.